I skipped last week's challenge in order to post about Chloe's birthday, but I'm back on the wagon for this week. I chose my night table with its stack of books. I've mentioned before that I am something of a night owl, and that on top of that I have dealt with insomnia quite a bit. So, at night, I read. And I say there are few things more comfortable than snuggling up with a good book. 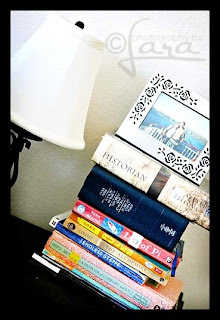 love the photo...and love the big old stack of books!!! That's one of my comforts too! I love to read! I love to read, but don't always make it a priority. I wish I would more often! That is comfy!!! Do you/did you like Life of Pi? I had a love/hate thing going with that book. I hated the whole stranded thing & I hated the whole not knowing what was "real" & what wasn't thing, but I still couldn't stop reading. Great picture Lara! I love to read too, it just doesn't happen to often. I need to make it more of a priority. These I Spy posts are really cool. I agree. I wasn't much of a reader growing up. I prefered being out doing things. Now my favorite way to pass the time is to grab a book.